I grew up in England and since I was a young girl I have always been an animal lover. I always had a pet, whether it was a budgie, hamster, dog, cat or horse. I owned my own horse from the age of 12 and still own one, having brought her over from the UK! I had an interest in dog training from a young age too, and trained the family dogs at obedience training and agility in my early teen years. I carried onto University to study Administrative Management. A career in project management and computer project installations followed. However, my interest in animals continued in my spare time. 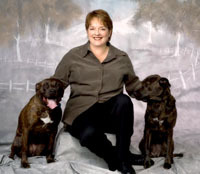 I rode my own horses regularly and also became a dog walker and adoption home assessor for my local dog rescue center. After a one year sabbatical traveling around the world in 2001, my husband and I returned home and continued our careers. However, I was regularly asked by family and friends to 'sort out' their pets and their horses, and these increasing requests led me to look around for some qualification that I could build into a long term career. I began studying at Southampton University for the Diploma in Companion Animal Behavior, one of the first courses of its kind in the UK and completed the diploma in 2005. Whilst in the middle of completing my diploma, my husband's job was relocated to the US and we settled in Atlanta in 2003. I started working for Dr Debra Forthman in her Animal Behavior Business , ABCS. I gained a lot of very valuable experience during this time, and have been very fortunate to be able to set up my own business to carry on this work, when Dr Forthman decided to close her own business. Dr Debra Forthman has agreed to provide a very valuable resource to my business as a consultant and advisor. 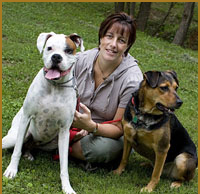 My Masters Degree in Companion Animal Behavior Counseling was completed in 2007. My thesis was concerned with correlations between dog behavior and attendance at dog daycare. I am currently working towards achieving Associate Level Behaviorist with the Animal Behavior Society. n high school, the study of veterinary medicine seemed logical for an animal lover, so I volunteered at the local clinic. At that time I began to read about behavior and was inspired by Jane Goodall's first book. After my first year in college I had decided to pursue animal behavior. At the University of California at Riverside, I began to study monkeys and apes. A childhood wish to live in Africa was fulfilled when I left for Tanzania to live for a year and study baboons in a national park. It was a wonderful and life-changing experience. I conducted my PhD work at UCLA, mentored by psychologist John Garcia, renowned for his work on conditioned taste aversion (CTA). During that time, I heard that a group of long-studied baboons in Kenya was raiding farmers' crops and being killed by the farmers. With my experience in applied CTA and baboons, I obtained a Fulbright fellowship and worked in Kenya for two years. I demonstrated that baboons could develop taste aversions for corn, but biochemical technology was not sufficiently advanced to make application feasible. From UCLA, I went to the Los Angeles Zoo and learned about the behavior of species I had never worked with, such as ungulates, carnivores and birds. I worked for another two years on a second taste aversion project in the southwest. I joined the staff at Zoo Atlanta in 1989 where I supervised scientific research on zoo grounds, most of which was conducted by graduate students of Dr. Terry Maple, Zoo Atlanta's director and a professor at Georgia Tech. During my last five years at the zoo, I developed a new department of Field Conservation. A talented and motivated staff worked on educational, research and conservation programs at the zoo and around the world. After my job at the zoo, I started a companion animal consulting business that taught me much about practicing the science of animal behavior as a clinician in private practice. Owners often say, "You are my last resort", so it is rewarding to be able to restore a harmonious relationship between owner and pet. Now I work as a part-time consultant for Faye Owen, the owner of this company, named, appropriately, "Animal Harmony".